The new BlackBerry Storm2 follows on from last year's original BlackBerry Storm, in a handset that looks almost identical to the original phone at first glance. But even when you look hard at the Storm2's technical specifications, the differences between this and last year's Storm are not obvious. Put simply, the Storm2 is an attempt to create the phone that the original Storm should have been in the first place. The first Storm was so full of bugs that we thought it was easily one of the worst phones of 2008.. added to this the completely inexcusable lack of WiFi in the original Storm, and overall the whole thing was extremely disappointing. Despite this, the Storm sold quite well on Verizon in the US and Vodafone in Europe, so it was clear that BlackBerry were doing something right. There are three main areas of improvement - firstly, the software. 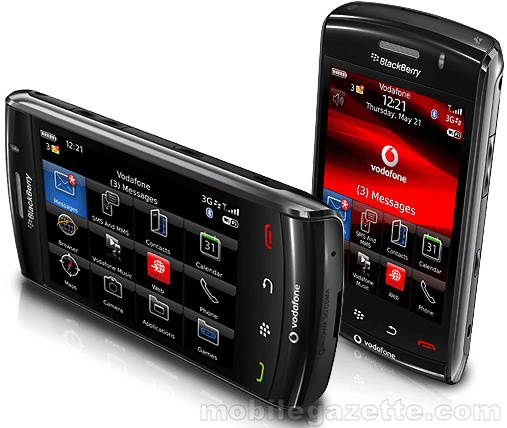 The original Storm was BlackBerry's first touchscreen device, and at times the software made this very obvious. The Storm2 completely overhauls the user experience with a new version of BlackBerry OS, in particular with a lot of improvements in the way that text entry is done. A second major upgrade is that the BlackBerry Storm2 now supports WiFi, as in our view the original Storm should never have been released without it. From the looks of it, the Storm2's WiFi includes all the features that corporate customers would need as well as meeting the needs of consumers. Finally, the internal memory is doubled to include an integrated 2GB card which can be expanded via the microSD slot with another 16GB, and probably 32GB when those cards become available. Most of the other specifications are basically unchanged - there's a large 3.25" 480 x 360 pixel touchscreen display in 65,000 colours, a 3.2 megapixel camera with autofocus and flash (the Storm2 adds image stabilisation), stereo Bluetooth 2.1 (upgraded from 2.0), and integrated GPS plus 3.5G data support. The multimedia player on the BlackBerry Storm2 supports MP3, AAC, Windows Media, MPEG4, H.263 and H.264 file types plus others, audio output is via a standard 3.5mm socket, but the Storm2 lacks an FM radio. Because this is a BlackBerry device, then email support is always going to be a strong point for both Enterprise customers and consumers. Of course, there's also a web browser, but we do feel that the relatively low resolution screen (compared with the Nokia N900, for example) is a significant limitation. There are also a number of personal information management tools to keep you organised. 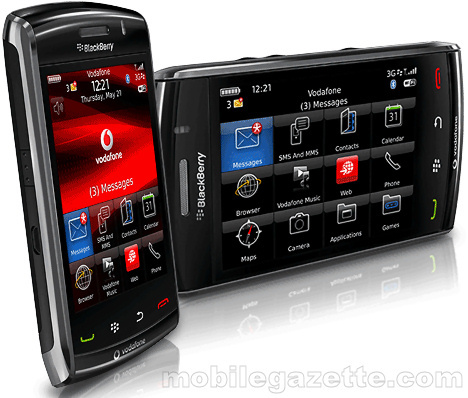 Further applications can be downloaded from BlackBerry App World. 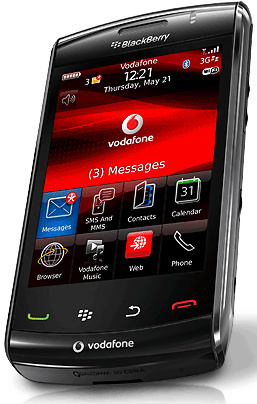 There are two versions of the BlackBerry Storm2 - the 9520 supports quad-band GSM plus 2100 MHz UMTS with HSPA high-speed data, and this is the phone that will be exclusive to Vodafone customers in Europe and elsewhere. The 9550 adds dual-band CDMA and EVDO support for the US Verizon network, while still retaining GSM / UMTS capabilities for worldwide roaming. The Storm2 should be available by the end of the year for most Vodafone customers, some illustrative pricing indicates that it will be free when taken with a £35/month 2 year contract in the UK. The situation with Verizon customers in the US is less clear, but we would still expect it to be in the shops by the end of the year. Obviously, the Storm2 is an improvement over the original Storm. But this is the phone that BlackBerry should have announced a year ago.. the phone they should be announcing now needs to be much better than this. In particular, we would expect to see a 640 or 800 pixel wide display these days, and the 3.2 megapixel camera is frankly uncompetitive. Overall, the Storm2 is somewhat disappointing and will soon be eclipsed by tough competition.